The Australian breeding industry celebrated its best and brightest today (Sunday August 27) with five prestigious awards handed out at a ceremony held in conjunction with Coolmore Australia’s annual stallion parade. 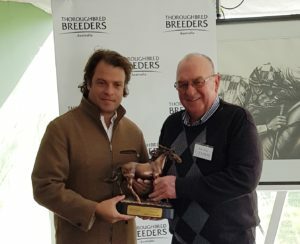 The event, hosted by Thoroughbred Breeders Australia (TBA), recognised the outstanding achievements of horses and breeders during the 2016-17 season. Securing the coveted Champion Australian Sire award was Arrowfield’s Snitzel (AUS), who established a new Australian record for progeny earnings, amassing over $16 million dollars in prize money. Snitzel recorded 26 individual stakes winners for the season, highlighted by Group One winners Russian Revolution (AUS), Redzel (AUS), Summer Passage (AUS) and Invader (AUS). 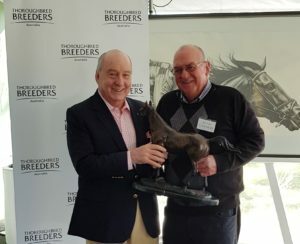 The award was presented by TBA President Basil Nolan to leading broadcaster and breeder Alan Jones AO on behalf of Arrowfield Stud. Snitzel (AUS) was also crowned Champion Sire of 2YOs, with eight individual two-year-old stakes winners for the season and two-year-old progeny earnings of $4.9 million. “It’s been a wonderful year for Arrowfield and I’d like to thank the whole team there who have done a wonderful job, as they do in all studs. We couldn’t survive without the work of the staff and they do a fantastic job. Champion First Season Sire was awarded to Coolmore’s Pierro (AUS), with Basil Nolan presenting the award to Coolmore’s Tom Magnier who was delighted with the result. The highest rated juvenile of his era, Pierro was represented by seven two-year old winners for the season with Group Three winning filly Tulip (AUS) his best performer. Presented by Jacqueline Stewart, the Manager of Owner and Breeder Services (Keeper of the Australian Stud Book), the Australian Broodmare of the Year went to Vegas Showgirl (NZ) for the second year running. Vegas Showgirl is the dam of champion mare Winx (AUS) who remains unbeaten in her last 18 starts and is currently rated the world’s best horse on turf, world’s best mare and world’s best middle-distance racehorse. Segenhoe Stud’s Peter O’Brien accepted the award on behalf of Vegas Showgirl’s owners John and Deborah Camilleri of Fairway Thoroughbreds. The final TBA award of the morning, the Aushorse Breeder of the Australian-Bred Exported Racehorse, went to Mr Enrique (Henry) Cojuangco, breeder of the ill-fated Hong Kong champion Rapper Dragon (AUS). Australian-bred Rapper Dragon made history during the season by becoming the first horse to sweep the Hong Kong four-year-old series, winning the Classic Mile, Classic Cup and Hong Kong Derby and earning the title of Hong Kong Horse Of The Year. Gooree Park Stud’s manager, Andrew Baddock, accepted the award on behalf of the late Mr Cojuangco who passed away in 2015. Speaking at the awards, which were compered by Caroline Searcy, TBA President Basil Nolan congratulated recipients on their success and wished the breeding industry the best of luck for the upcoming season. “Our industry continues to go from strength to strength and I am delighted that we can gather today to celebrate the success of these outstanding individuals and the contribution they’ve made to the breeding and racing landscape of Australia and the world. Following the TBA National Awards, Thoroughbred Breeders New South Wales (TBNSW) recognised two other outstanding achievers. NSW Champion Broodmare Of The Year was awarded to National Colour (SAF), dam of South African Group One winners Mustaaqeem (AUS) and Rafeef (AUS). The President’s Award for Outstanding Achievement was presented by TBNSW’s Les Young to Mr Rob Manwaring, breeder of Capital Gain (AUS) and Grande Rosso (AUS).